Turing is a Turing Machine Simulator. The App runs on iPhone, iPod Touch and iPad. Students of computer science and maths are probably familar with Turing Machines, because the Turing Machine is one of the important models when analyzing if mathematical problems or algorithms are computable. Usually dealing with Turing machines requires paper and pencil for simulating the program execution. 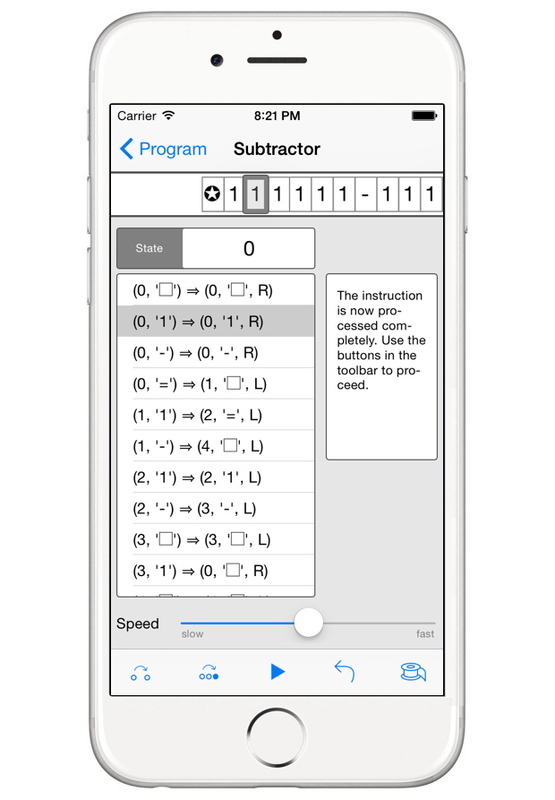 This app will help here by providing several ways to execute Turing programs and analyze it in an easy and comfortable way. Execute your programs in different ways (step by step, run in different speeds, etc). Export and import programs (backup, share programs with your friends). Comes with some example programs to play with.